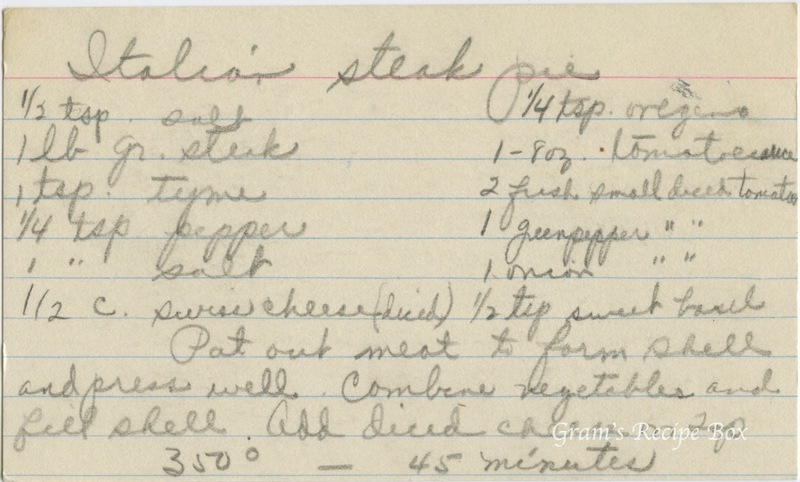 We recently saw a recipe I called Hamburger Pie because it reminded me of a recipe in my mother’s cookbook. Today we will look at another type of hamburger pie with an Italian slant. The recipe lists salt twice but I can’t see any reason why you couldn’t omit one measurement of it. I use very little salt in my cooking, so if I were to make this, I’d go with the lesser amount of salt. Pat out meat to form shell and press well. Combine vegetables and fill shell. Add diced cheese on top.